Our missionaries wanted to do something different to contact new people, so they decided to go to the Post Office on a Saturday morning and sing hymns and give out tracts, etc. It was actually very interesting to watch them at work. They took turns approaching people. Some didn’t show any interest, but others responded with an address and phone number. We stayed for about two hours, and we found it to be an interesting time. This is the baptism of a new brother who joined the Church from the Moule area. A number of the missionaries were involved in teaching him, so they were all very happy to see him accept the challenge to come into the fold of Christ. All the sisters spent a day together up in the mountains at a park in commemoration of the RS birthday. We had to hike down and then later of course back up a very steep set of stairs. But, it was worth it to be in the beauties of the earth. It was just a fun day and each branch R.S. president had something to say and then presented a skit with a message. We all had a lunch together and just enjoyed being with other sisters. We had a few visitors crash the party and they just wouldn’t take no for an answer. Some of us went swimming in the pond and others just visited and walked around together while others took advantage of getting their hair done. They really know how to braid each other’s hair in these tiny braids. Even the little kids have theirs done this way. It was a great day, but we still had to climb the steep stairs back up. Maybe there is some symbolism there? One of the couples we helped teach and who joined the Church are the Cesarins. They are around our age and super nice people. They have a neat house not too far from us. We had them over to dinner and the next month they had us over to their house for dinner. They raise much of their own food and even raise pigs to eat. We asked him who butchers the pigs, and he said his wife does. Ugh. Fortunately, we had already eaten the “pork”, but later we went outside and visited the still living pigs. We don’t think we could eat our pets but who knows. Depends on how one is raised we guess. Nevertheless, we had a great time being with them at our house and then at theirs. They are looking forward to being sealed in the temple after they have been members long enough. 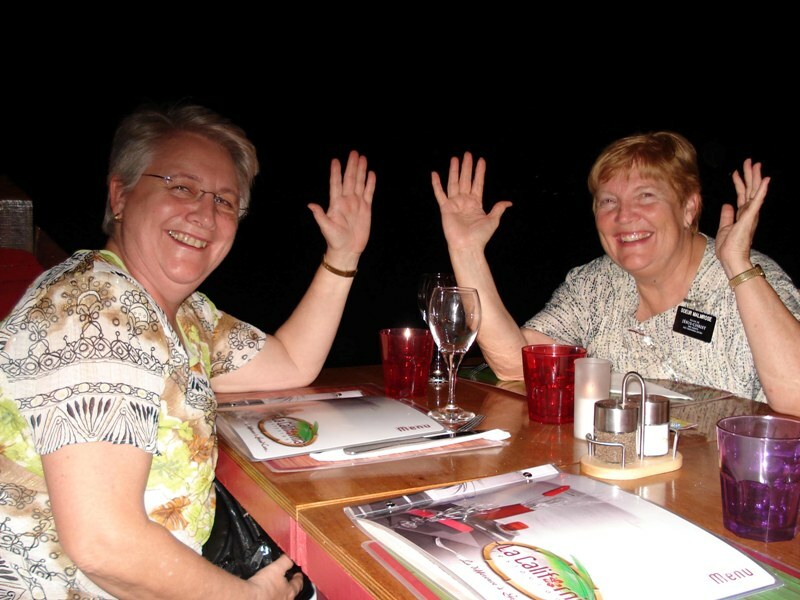 Here is a picture of our French North missionaries. Our senior sister missionary Sister Laquembe from Martinique made this giant cake and brought it for our zone meeting . luncheon. She said security wasn’t going to let her take it on the plane, so she just told them that they should feel terrible keeping this nice cake from our missionaries. They let her through security and we all shared in the results. She is not the type of person to take “no” for an answer and you don’t want to cross Sister Laquembe! We invited them over to our apartment for dinner and had a great time with them. They have served a full time mission in Haiti and now serve on their home island of Martinique. We have three senior couples serving on the French islands and the rest are young missionaries from France, Tahiti and the U.S. The Tahitian missionaries love to sing and do so at any opportunity. They are a lot of fun and we love being with them. Elder Atwood is one of the assistants to the mission president. He was due to go home very soon, so he asked us if we would do the talk we give to each of our missionaries who are soon to return home. He had heard about the “Malmrose Proclamation for a Happy Life”, and he didn’t want to miss out. So…we gave him the talk and this picture before he left for home. We had our mission doctor, Dr. Otto, come and he gave some interesting information to the missionaries concerning how to remain healthy. This is one of his demonstrations. 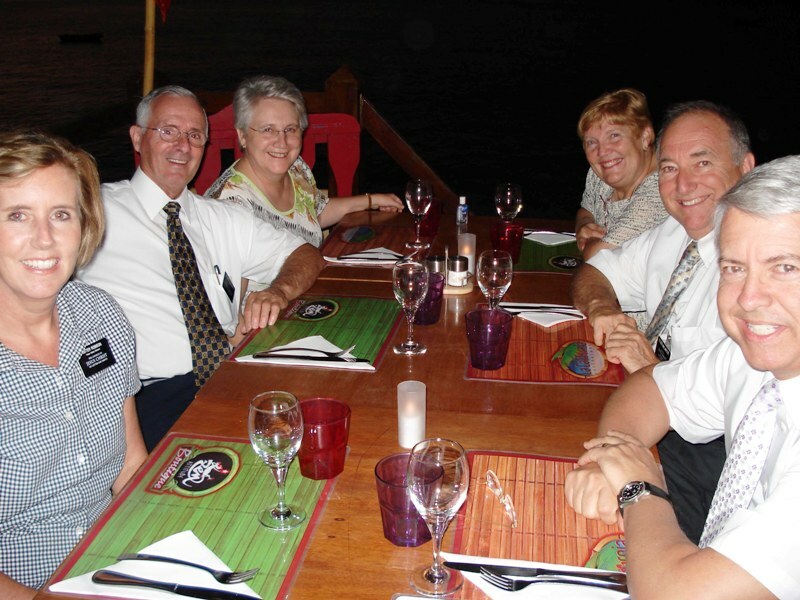 We were able to spend a little time with our mission president and his wife and our mission doctor and his wife. They are great people. The last picture is of our district missionaries with their “Hurray for Israel” salute. The missionaries and our friend the Bastion’s surprised me with a cake and some birthday gifts. One of the Tahitian Elders, Elder Pahio, gave me black pearl earrings and necklace from Tahiti. What a thoughtful gift. He is a great, big, strong guy and as you can see he has huge feet. Nevertheless, he is a real softy and we love him. Later, when we were in St. Martin, we went to dinner with the mission president and his wife and the Coleman’s the senior couple there. It is also her birthday week, so we celebrated together. What great people these are and we love being with them. We went here on Church business and enjoying visiting with the members and missionaries. French Guyana in on the South American continent and is a long way away from Guadeloupe, but they speak French, so they are part of our District. It was Easter, so one of the American students invited us to dinner with her and her visiting family. Also, the branch president invited us to dinner with his family, kids and grandkids. They sure take good care of us. One of our newer missionaries is from France. He is super tall so I commented that the French aren’t usually so tall. He said not to tell anyone, but his family is from Germany. That explains it. The last picture is from our hotel window and looks down one of the streets in the city of Cayenne. This is the lest modern of all the places we travel to, but is still very nice. President Gamiette’s mother, Sister Monpierre invited us to have lunch with her. She is one of the earliest members of the Church in this area. She set a beautiful table and we had a wonderful time visiting with her and our mutual friend, Sister Prince. These are some pictures of her with pictures on the wall of her parents. Pres. Gamiette is holding a picture of him and his sister when they were young children. The Gamiette’s think that we don’t take enough time off so they insisted that we come with them swimming for a “P” day. This is at the beach but there is a stream of water coming down from the volcano and comes out HOT. It pours into the ocean water and is so hot we couldn’t get very close to the outlet. But the water a little way out was really nice and comfortable. It is full of minerals and is said to be very healthful. What spectacular sunsets we have. These are pictures of some of their kids. They are really cute and we love them. Their mom served a full time mission in Seattle and they hope to come to visit us someday so that she can see some of her friends again. Here are few extra pictures. Gerald and Lorna at our apartment. The District Presidency, Pres. Gamiette, his counselors Pres. Monnardin and Pres. Ammasouga and the Executive Secretary, Elder Malmrose. These are pictures of some of our friends here. Sister Galbas from Lamentin, is a happy, faithful sister who has only been a member for 2 years. I thought she had been a member for much longer because of the depth of her testimony. The next picture is of our dear Sister Monpierre, her daughter Sister Vautier and our Elder Pahio. The Skousens came from Santa Domingo as Area auditors. Since Elder Malmrose is the auditor for the French District, they had a lot to talk about. Sister Skousen and I just enjoyed girl talk while the men worked. Works for us!